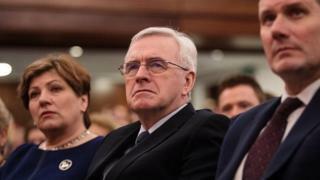 Image caption Shadow chancellor John McDonnell (centre) warns of "dark arts"
Shadow Chancellor John McDonnell says "a soft coup" has been launched against Jeremy Corbyn by "elements in the Labour Party". One former Labour minister described Mr McDonnell's comments as "unhinged". In his article, Mr McDonnell accuses "the coup perpetrators" of "a covert strategy" to destabilise Mr Corbyn because they had failed to dislodge him directly through a leadership election. He said their tactics included "daily and constant behind-the-scenes non-attributable briefings against Jeremy". It is understood the article by Mr McDonnell was written before Labour's Copeland by-election loss but posted on the Labour Briefing website on Sunday night. A spokesman for Mr McDonnell said: "This article was written over a week ago in response to the intervention from Tony Blair. "It was published in print last week and only went online last night. "However, as John said yesterday, he wants us all to focus on party unity following last week's by-election results. "And he is looking to reach out in the coming days to those across all sections of the party and none." Media captionJeremy Corbyn: "Now is not the time to run away"
Mr Corbyn, from the left of the party, was the overwhelming winner of Labour's leadership election in 2015, despite having the support of only a small number of the party's MPs. A challenge to him last year led to another vote of all Labour Party members and affiliated supporters, which he again won overwhelmingly. But many of the party's MPs have continued to be unhappy with his leadership, and the party trails the Conservatives in opinion polls. 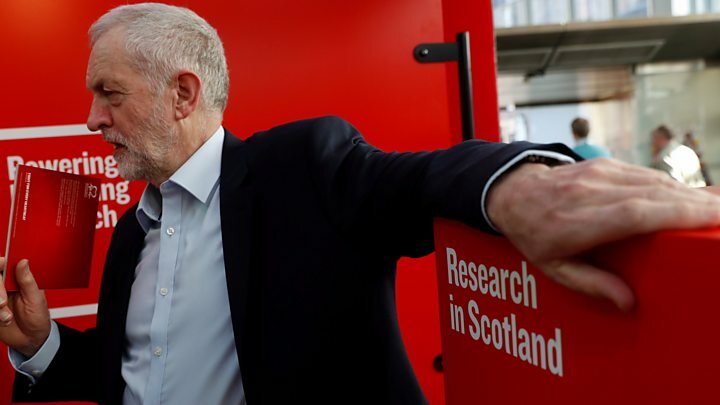 At Monday night's Parliamentary Labour Party (PLP) meeting, some MPs criticised Jeremy Corbyn's non-attendance, with one telling the BBC they would raise the Copeland defeat each week until the leader addressed it. A party spokesman said Mr Corbyn had given his apologies for being unable to make the meeting and didn't attend every time. Andrew Gwynne - the joint elections co-ordinator (with Ian Lavery) - oversaw the Copeland campaign and was supportively shouted down by MPs when he suggested taking responsibility for the defeat himself. He was applauded for praising local activists and the neighbouring MP John Woodcock - a long-standing opponent of Jeremy Corbyn - for their efforts in the campaign. He also said he looked forward to working with the PLP on the forthcoming local elections - the main issues would be health, housing and jobs. Sources at the meeting suggested one of the more amusing questions came from former shadow transport secretary Lilian Greenwood, who read out a long list of reasons given over the weekend by party spokespeople for the loss of Copeland, and which hadn't included the party leadership. She then asked: "Have I left anything off that list?" Some MPs were critical of shadow attorney general Baroness Chakrabarti, who had outlined some of those reasons on television over the weekend but who hadn't attended the PLP. A picture of her drinking with shadow home secretary Diane Abbott in the nearby Pugin room while the meeting was taking place had been tweeted and was raised by MP Neil Coyle. One MP told reporters: "Shami had a lot to say at the weekend. It's a shame she had nothing to say at the meeting." On Sunday, Mr Corbyn said Labour's by-election loss showed "the scale of how hard our task is to persuade people of our message". In a speech, he urged his party to "remain united" and not to "give up". Labour lost the seat of Copeland, in Cumbria, to the Conservatives last week - the first by-election gain by a governing party in 35 years. However, Labour managed to hold off a challenge from UKIP in a by-election, in Stoke-on-Trent Central, on Thursday. Questioned about his future after the speech, Mr Corbyn said: "I'm carrying on as leader because I'm determined that we will deliver social justice in this country." Asked if he would still be in place in 2020, when the next general election is expected to take place, he replied: "I've given you a very, very clear answer - yes."